I love making sure my bride-readers are prepared for any and everything that may come their way while planning their big day! I know how it feels to be frantically running around trying to make sure everything is in place but still managing to misplace or make the wrong decision on some small but crucial details. Today, I’m going to give you a little heads up on some things to avoid and consider during your beach wedding ceremony that you may not have thought about too much beforehand. Now aren’t you glad you have me? Hot coals may be fine in your favorite sauna, but the feeling is not that pleasant under your feet while trying to enjoy your wedding! I’m pretty sure that you’re familiar with having to walk on hot sand and sharp seashells in your single days. Yikes! To remedy this, simply find the most comfortable flats, sandals, or flip-flops that you can get your hands on. Trust me; it will save you a lot of headache! In the summertime, people more than likely want their skin to breathe with ease. This should apply to your bridesmaids as well. Don’t let your bridesmaids suffer with heavy fabrics that will make them uncomfortable. They’re standing next to you in support and love. Be sure to let your fiancé know that this same rule applies for the groomsmen as well. Make sure that you select dresses that are sun-friendly and causal when it comes to color and fabric. Lighter colors will reflect heat and lighter fabrics will encourage air flow. For the guys, make sure they are casually cool as well. I know that you have probably dreamed of having the most perfect princess dress with a beautiful long train to follow you to the altar. I hate to break it to you but that kind of dress just won’t cut it on the beach. However, don’t be sad! The reason why I say this is because your train will become completely ruined the minute it hits the sands. To avoid the heart-wrenching feeling of your money being flushed down the drain, opt for a more lightweight dress that flows. Imagine being able to jump, dance, and prance around the ocean with your wedding dress after your ceremony. You definitely will have one-upped on Cinderella! Just as much as you want your bridal and groomsmen party to be comfortable on your special day, you also want to make sure that your guests are just as comfortable as well. You want them to know the dress code ahead of time. While putting together your invitations, its best to assume that not everyone will know how to properly dress for a beach wedding. The best way to ensure that all of your guests are aware is to make it clear so there are no questions. You can use key words such as “Beach Casual”, which would imply that your guests can dress as comfortable as possible, “Beach Formal”, which would imply that your guests should dress for a more chic beach wedding, and “Beach Semiformal”, which would imply that your guests can find a happy comfortable medium. You don’t want your grumpy gramps coming to your wedding in bright plaid flannel pants! Let’s face it; some of the wedding favors that are carefully added throughout the wedding and reception can end up on the floor or in the trash by the time you’ve finished partying. Make your wedding favors useful by providing something that your guests could always use another time. For a beach wedding, some cool sunglasses or straw fans would be an awesome way to further ensure your guests can fully enjoy your big day. The last thing you are probably thinking about while planning your wedding is the possibility of other weddings or events taking place around the same time as your big day. Another little factor to take into consideration is that your guests may not be too familiar with the beach venue you have chosen. A good solution to this potential disaster is to plant a few noticeable, but stylish signs to direct them to the right place. 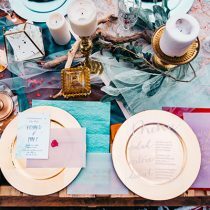 Now I know I told you gals to make sure you spice up your wedding décor and not to just rely on the ocean and sand alone, but make sure your décor is done in moderation! Because you’ve chosen to have a beach wedding, your environment will automatically enhance whatever décor and color themes you choose. Be sure to not take away from the ambiance with too many unnecessary details. One of the most tiring things you can do is put everything on yourself. Unless you want to look like the crypt-keeper the morning of your wedding, it’s best to hand over some of the work to a wedding planner. It is a wedding planner’s job to make sure that you are not bogged down with everything that needs to be done. Take full advantage of all the resources available to you! Just like you can’t guarantee that you will be the only wedding or event on the beach, it’s impossible to guarantee that the weather will stay perfect the entire time. Being that you have zero control over this factor, it’s best to prepare for the possibility ahead of time. If you’re able to, have an indoor venue on standby just in case. One of the last minute essentials that you should have in your wedding bag is some sunscreen. No bride wants to look like a radish in her pictures! Check and double check the quality of your sound system before the ceremony. You want your guests to hear you profess your undying love for your spouse and not sound like Charlie Brown’s school teacher. While you are in the midst of the hustle and bustle that comes to planning and attending your own wedding, be sure to take some time to nurture yourself as well. Keeping a bottle of water with you wherever you go will ensure that you don’t get lightheaded or queasy on top of all the emotions you will already have that day. I’m totally convinced that you will be an amazing bride pretty soon! With all this insider knowledge of how to properly prepare, you may be able to teach other brides a thing or two!